The pier sits in the Point Arena cove. Point Arena itself juts out to the west (and is in fact the closest point in the continental United States to Hawaii). The old wooden pier, destroyed during the winter of 1982-'83, was replaced with a spiffy 322-foot-long steel and concrete deal with a boat launch and hoist. Offshore is some of the world's deepest waters in the Mendocino Trench; and the underwater Arena Canyon and Navarro Canyon begin directly out from the Point. The cove itself is 20-100 feet deep, sits southeast of the point and is protected somewhat from northwest winds and storms. The entire cove has a rocky bottom with no sand or gravel, a small stream runs into the ocean to the left of the pier, and there are reefs to both the south and north of the pier. FISHERMEN: If you want to go fishing, the pier has a boat launch and a hoist, open 7 a.m. to 4 p.m. every day, depending on the weather. Also on the pier are fish-cleaning tables, outdoor showers and restrooms. Fish found here are rocky-area species; they include kelp and rock greenling, cabezon and lingcod, striped, white and (a few) calico perch, walleye and silver surfperch, shinerperch, grass, black and blue rockfish, small bocaccio, Pacific tomcod, starry flounder and an occasional salmon. Unusual species include large buffalo sculpin and wolf eels. SURFERS: This sheltered fishing pier and boat landing, surrounded by lunar bluffs of Salinian sandstone, is home to some of the best waves on the north coast. When conditions are optimum, the point (which is the main break, on the north side of the pier) is a steep, ledgy takeoff followed by a thick, fast right which either peters into the deep channel or sends you into the sharp rock shelf on the inside (watch out for the rusty ship boiler on the inside during low tide). The wave barrels and can, at any moment, humble you to shore. Needs at least a 6-foot swell to break. When it's smaller, the wave peels dangerously close to the inside ledge, so fasten your leash tightly. Find the keyhole in the reef along the shoreline (in front of the channel) and paddle out through there. The flip side of the PA coin is the left that breaks on the south side of the pier, best when it's a foot or two overhead and glassy -- great during clean south swells. Watch out for the dangerous rocks and ledges on the inside. 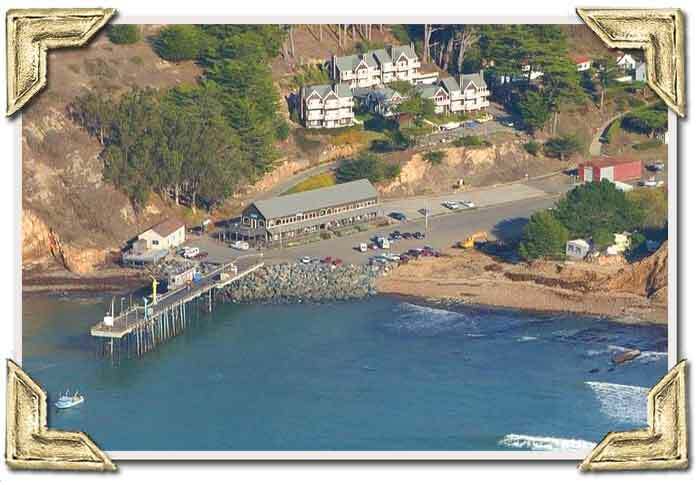 Click the [Satellite] Button on the right corner of the map to see the areal image of the Point Arena Pier in Point Arena Cove, Point Arena CA.